Invasive Plant Control in Protected Areas of BC. Invasive Plants in B.C.’s Protected Lands, A Strategic Plan by Brian Wikeem and Valerie A. Miller for Laura Darling, Protected areas Ecologist, Ministry of the Environment. , Victoria. This panel refers to the Control of the Invasive Species Phragmites australis (Cav.) Trin.ex.Steud.subsp.australis. This is a semi aquatic emergent invasive reed grass that has been dealt with in the Galiano Bog Ecological reserve: More information to follow. I am particularly concerned about this species as it is almost indistinguishable from the native species . In November 2009 , ERRDP determined that a population of Phragmites was the invasive species. 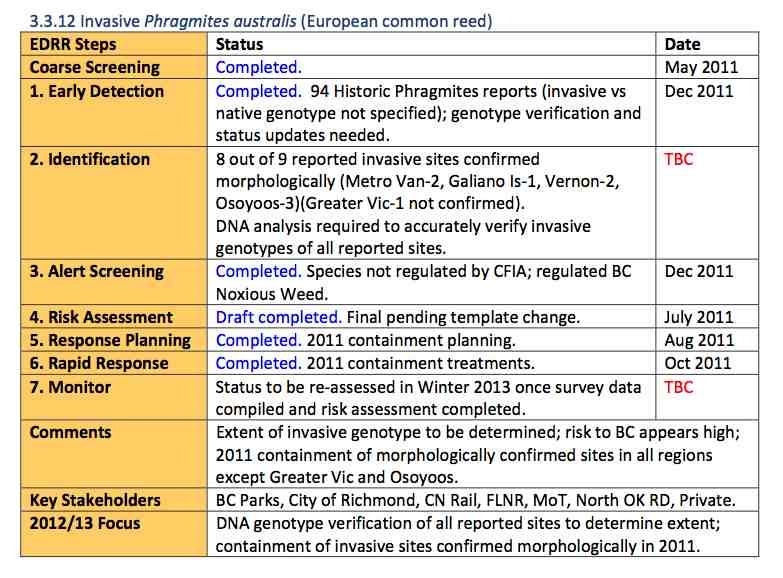 By DNA analysis it was determined to be the native species, Phragmites australis (Cav.) Trin.ex.Steud.subsp.americanus.